Yet all this was only the prologue of the actual Dunwich horror. Formalities were gone through by bewildered officials, abnormal details were duly kept from press and public, and men were sent to Dunwich and Aylesbury to look up property and notify any who might be heirs of the late Wilbur Whateley. They found the countryside in great agitation, both because of the growing rumblings beneath the domed hills, and because of the unwonted stench and the surging, lapping sounds which came increasingly from the great empty shell formed by Whateley's boarded-up farmhouse. Earl Sawyer, who tended the horse and cattle during Wilbur's absence, had developed a woefully acute case of nerves. The officials devised excuses not to enter the noisome boarded place; and were glad to confine their survey of the deceased's living quarters, the newly mended sheds, to a single visit. They filed a ponderous report at the courthouse in Aylesbury, and litigations concerning heirship are said to be still in progress amongst the innumerable Whateleys, decayed and undecayed, of the upper Miskatonic valley. An almost interminable manuscript in strange characters, written in a huge ledger and adjudged a sort of diary because of the spacing and the variations in ink and penmanship, presented a baffling puzzle to those who found it on the old bureau which served as its owner's desk. After a week of debate it was sent to Miskatonic University, together with the deceased's collection of strange books, for study and possible translation; but even the best linguists soon saw that it was not likely to be unriddled with ease. No trace of the ancient gold with which Wilbur and Old Whateley had always paid their debts has yet been discovered. It was in the dark of September ninth that the horror broke loose. The hill noises had been very pronounced during the evening, and dogs barked frantically all night. Early risers on the tenth noticed a peculiar stench in the air. About seven o'clock Luther Brown, the hired boy at George Corey's, between Cold Spring Glen and the village, rushed frenziedly back from his morning trip to Ten-Acre Meadow with the cows. He was almost convulsed with fright as he stumbled into the kitchen; and in the yard outside the no less frightened herd were pawing and lowing pitifully, having followed the boy back in the panic they shared with him. Between gasps Luther tried to stammer out his tale to Mrs Corey. Here he faltered, and seemed to shiver afresh with the fright that had sent him flying home. Mrs Corey, unable to extract more information, began telephoning the neighbours; thus starting on its rounds the overture of panic that heralded the major terrors. 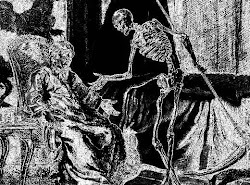 When she got Sally Sawyer, housekeeper at Seth Bishop's, the nearest place to Whateley's, it became her turn to listen instead of transmit; for Sally's boy Chauncey, who slept poorly, had been up on the hill towards Whateley's, and had dashed back in terror after one look at the place, and at the pasturage where Mr Bishop's cows had been left out all night. 'Yes, Mis' Corey,' came Sally's tremulous voice over the party wire, 'Cha'ncey he just come back a-postin', and couldn't half talk fer bein' scairt! He says Ol' Whateley's house is all bowed up, with timbers scattered raound like they'd ben dynamite inside; only the bottom floor ain't through, but is all covered with a kind o' tar-like stuff that smells awful an' drips daown offen the aidges onto the graoun' whar the side timbers is blowed away. An' they's awful kinder marks in the yard, tew—great raound marks bigger raound than a hogshead, an' all sticky with stuff like is on the browed-up haouse. Cha'ncey he says they leads off into the medders, whar a great swath wider'n a barn is matted daown, an' all the stun walls tumbled every whichway wherever it goes. 'An' he says, says he, Mis' Corey, as haow he sot to look fer Seth's caows, frightened ez he was an' faound 'em in the upper pasture nigh the Devil's Hop Yard in an awful shape. Haff on 'em's clean gone, an' nigh haff o' them that's left is sucked most dry o' blood, with sores on 'em like they's ben on Whateleys cattle ever senct Lavinny's black brat was born. Seth hes gone aout naow to look at 'em, though I'll vaow he won't keer ter git very nigh Wizard Whateley's! Cha'ncey didn't look keerful ter see whar the big matted-daown swath led arter it leff the pasturage, but he says he thinks it p'inted towards the glen rud to the village. 'I tell ye, Mis' Corey, they's suthin' abroad as hadn't orter be abroad, an' I for one think that black Wilbur Whateley, as come to the bad end he deserved, is at the bottom of the breedin' of it. He wa'n't all human hisself, I allus says to everybody; an' I think he an' Ol' Whateley must a raised suthin' in that there nailed-up haouse as ain't even so human as he was. They's allus ben unseen things araound Dunwich—livin' things—as ain't human an' ain't good fer human folks. 'The graoun' was a-talkin' las' night, an' towards mornin' Cha'ncey he heered the whippoorwills so laoud in Col' Spring Glen he couldn't sleep nun. Then he thought he heered another faint-like saound over towards Wizard Whateley's—a kinder rippin' or tearin' o' wood, like some big box er crate was bein' opened fur off. What with this an' that, he didn't git to sleep at all till sunup, an' no sooner was he up this mornin', but he's got to go over to Whateley's an' see what's the matter. He see enough I tell ye, Mis' Corey! This dun't mean no good, an' I think as all the men-folks ought to git up a party an' do suthin'. I know suthin' awful's abaout, an' feel my time is nigh, though only Gawd knows jest what it is. That night everyone went home, and every house and barn was barricaded as stoutly as possible. Needless to say, no cattle were allowed to remain in open pasturage. About two in the morning a frightful stench and the savage barking of the dogs awakened the household at Elmer Frye's, on the eastern edge of Cold Spring Glen, and all agreed that they could hear a sort of muffled swishing or lapping sound from somewhere outside. Mrs Frye proposed telephoning the neighbours, and Elmer was about to agree when the noise of splintering wood burst in upon their deliberations. It came, apparently, from the barn; and was quickly followed by a hideous screaming and stamping amongst the cattle. The dogs slavered and crouched close to the feet of the fear-numbed family. Frye lit a lantern through force of habit, but knew it would be death to go out into that black farmyard. The children and the women-folk whimpered, kept from screaming by some obscure, vestigial instinct of defence which told them their lives depended on silence. At last the noise of the cattle subsided to a pitiful moaning, and a great snapping, crashing, and crackling ensued. The Fryes, huddled together in the sitting-room, did not dare to move until the last echoes died away far down in Cold Spring Glen. Then, amidst the dismal moans from the stable and the daemoniac piping of the late whippoorwills in the glen, Selina Frye tottered to the telephone and spread what news she could of the second phase of the horror. When night came again the barricading was repeated, though there was less huddling together of families. In the morning both the Frye and the Seth Bishop households reported excitement among the dogs and vague sounds and stenches from afar, while early explorers noted with horror a fresh set of the monstrous tracks in the road skirting Sentinel Hill. As before, the sides of the road showed a bruising indicative of the blasphemously stupendous bulk of the horror; whilst the conformation of the tracks seemed to argue a passage in two directions, as if the moving mountain had come from Cold Spring Glen and returned to it along the same path. At the base of the hill a thirty-foot swath of crushed shrubbery saplings led steeply upwards, and the seekers gasped when they saw that even the most perpendicular places did not deflect the inexorable trail. Whatever the horror was, it could scale a sheer stony cliff of almost complete verticality; and as the investigators climbed round to the hill's summit by safer routes they saw that the trail ended—or rather, reversed—there. Thursday night began much like the others, but it ended less happily. The whippoorwills in the glen had screamed with such unusual persistence that many could not sleep, and about 3 A.M. all the party telephones rang tremulously. Those who took down their receivers heard a fright-mad voice shriek out, 'Help, oh, my Gawd! ...' and some thought a crashing sound followed the breaking off of the exclamation. There was nothing more. No one dared do anything, and no one knew till morning whence the call came. Then those who had heard it called everyone on the line, and found that only the Fryes did not reply. The truth appeared an hour later, when a hastily assembled group of armed men trudged out to the Frye place at the head of the glen. It was horrible, yet hardly a surprise. There were more swaths and monstrous prints, but there was no longer any house. It had caved in like an egg-shell, and amongst the ruins nothing living or dead could be discovered. Only a stench and a tarry stickiness. The Elmer Fryes had been erased from Dunwich. "The Dunwich Horror" is a tale by H. P. Lovecraft. Written in 1928, it was first published in the April 1929 issue of Weird Tales (pp. 481-508).